Today's brands face an apparent choice between two evils: continue betting on their increasingly ineffective advertising or put blind faith in the supposedly mystical power of social media, where "likes" stand in for transactions and a mass audience is maddeningly elusive. There has to be a better way . . . As Lennon and McCartney wrote a half century ago, money can't buy you love. But in today's world, where people have become desensi­tized-even disillusioned-by ad campaigns and marketing slogans, that maxim needs an update: Money can't even buy you like. Bob Garfield is the cohost of NPR's 'On The Media' and a columnist for MediaPost. Previously at Advertising Age, he has been a prominent commen­tator on and analyst of advertising and marketing for thirty years. His previous books include The Chaos Scenario. He lives outside Washington, D.C. Doug Levy is the founder and CEO of MEplusYOU, a leading strategic and creative agency that believes authentic relationships fuel astonishing brands. This is his first book. He lives in Dallas. —Tony Hsieh, author of Delivering Happiness and CEO, Zappos.com, Inc. 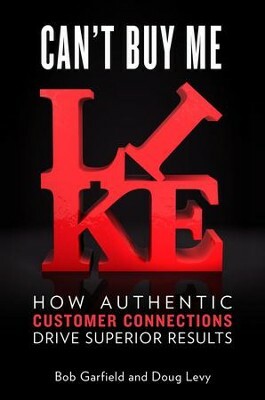 I'm the author/artist and I want to review Can't Buy Me Like: How Authentic Customer Connections Drive Superior Results - eBook.